I think this was my first lasagna in about 10 years. 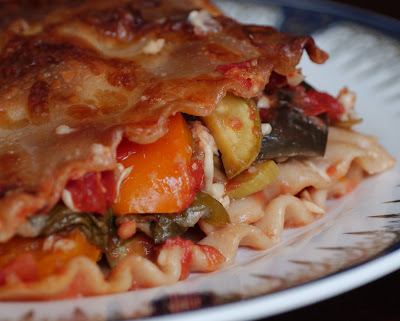 I never made lasagna myself at home before, and I stopped having any pasta dishes in restaurants many years ago. When I met my husband, he once said, that he never eats pasta in restaurants because pasta you can make easily at home whereas a good pizza is difficult to make without the right ingredients and the right oven. We are quite good with making various pasta dishes. But I had never made lasagna. I chose a vegetarian lasagna recipe and it turned out just brilliant. 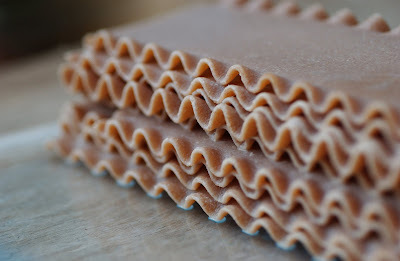 I loved the freshness and the lightness that came out between the pasta sheets. Much better than all the meat-based lasagnas drowned in heavy Bechamel saucethat I had before. The fact, that it can be made in advance is just another reason why I will make this lasagna again. Put all vegetables (apart from the tomatoes and spinach), diced and chopped, into a plastic bag. Drizzle a teaspoon of olive oil into the bag and shake vigorously, so the oil spreads evenly onto the veggies. Roast for 30 minutes in the oven, turning occasionally. Remove the vegetables from the oven. Stir in tomatoes and spinach and about half of the grated cheese. Pour hot water over the lasagna sheets and leave for 10 minutes until softened an little. Drain afterwards. Stir together Creme Fraiche, milk and remaining cheese. Layer the lasagna sheets with the vegetable mixture and Creme Fraiche mixture (keep some for the top) alternatively in an ovenproof dish, starting and ending with lasagna sheets. Pour remaining Creme Fraiche sauce on top. Preheat oven to 190 degrees Celsius. Bake for 50-60 minutes, until top is golden brown.